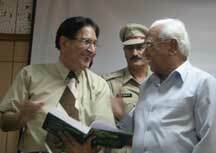 CHANDIGARH July 27, 2008: The two day symposium on Cancer Stem Cell jointly organized by Panjab University, Chandigarh and Institute of Cytology and Preventive Oncology (ICPO) Noida was inaugurated by Dr. A. R. Kidwai,Governor, Haryana at Panjab University, Chandigarh here today. This event is sequal to three earlier Stem Cell Symposias organized by Panjab University to sensitize students, research scholars and faculty in Panjab University Chandigarh. About 100 participants and experts participated in this event. In his inaugural address, Dr. A.R. Kidwai, Governor Haryana stated that holding of events like this is the need of hour keeping in mind the vast diversity which is available in India unlike in other countries. He emphasized on the total commitment of the youth towards the field of Biological Sciences so as to make India a leader in Biological fields like it has been done in the IT field. Prof. Awtar Krishan from University of Miami Florida, USA, Foreign Advisor to this Symposium was the Guest of Honour. Prof. Awtar Krishan elaborated on the theme of the Symposium and explained the necessity to have more such meetings to reap the benefit out of mutual collaborations of the Eminent Scientists both from India and the abroad. initiative on starting new courses like Stem Cell and Tissue Engineering, Microbial Technology among many others under the emerging areas of Science and Technology which the Punjab University is going to start. Prof. S.K. Kulkarni, Dean University Instructions extended his good wishes and smooth conduct of the event.Following the inaugural ceremony, the delegates and participants spent some time in the plantation drive initiated by Prof. R.C. Sobti. marrow and adipose tissue in the treatment of Cardiovascular diseases. Dr.Sharmila Bapat from National Centre for Cell Sciences (NCCS) Pune shade a light on Cancer Stem Cell in the context of their isolation,characterization, marker identification and applications. Dr. Arvinder Singh, Head Science and Technology, B.D. Bio-sciences talked about the use of Flow Cytometry in Immunophenotyping of haematopoietic stem cells. The second scientific session started with the Lecturer by Dr. Ashok Gupta,Head Department of Otolaryngology, PGI discussed about the use of bone marrow mononuclear cells in the management of traumatic optic neuropathy. This was followed by lecture by Sh. Avtar Krishan, from University of Miami on differentiation of normal and tumor cells by expression studies of various hormone receptors. He also deliberated on the methodology involved in isolation of stem cells by flowcytometry.Dr. Neelam Verma, Head Department of Haemotology, PGI, Chandigarh talked about the use haematopoitic stem cell in clinical settings. Dr. Bindu Dey from the department of Bio-technology spoke about the funding opportunities that DBT , India is providing an exhorted the researchers and students to submit proposals which will address the application of stem cells in regenerative medicine. I am very happy to not that people are well advanced in Cancer Stem cell science in India. However, I might add that Cancer stem is still a hypothesis and everyday. there are articles appearing the untenable nature of this hypothesis. I would like to bring to your attention my work on neosis and self-renewal in cancer. According to my hypothesis, it is the senescent cell that is responsible for the origin and continuous growth of all tumors. Neosis is defined as the parasexual, somatic reduction division of a polyploid giant senescent cell, characterized karyokinesis via nuclear budding followed by asymmetric cytokinesis, yielding several (usually about 10 or more) small stem-like Raju cells, wahich undergo transit amplificaion via symmetric mitosis and mature into tumor cells. You can find all info about neosis and its role in cancer from the internet by googling for the words “Neosis + Rajaraman”. I might add that my hypothesis is based on video documentation. Everyday people are finding my hypothesis more accepable. However, it is going to take several years for the general public to realize the truth about cancer biology. Thank you for your time.